The Westport-based political organizing group the Resisters poses in downtown Westport on Oct. 1. WESTPORT — On a Monday morning, 20 Westport women gathered in a downtown restaurant for a meeting of the Resisters political action group. “One of the benefits of coming here is it’s a place to feel like we can breathe and speak our minds and get some of that frustration out,” Westporter Melissa Shein told the group in opening the meeting. Schein founded the group as a subset of the Westport Democratic Town Committee, the local branch of the Democratic Party, in the wake of the 2016 election of President Donald J. Trump. “I needed to learn. I can’t make phone calls just because I’m mad. I need to know why I’m making the call,” Schein said, adding she was not politically active before 2016 and following the election, sought a place to educate herself where she wouldn’t feel ridiculed for questions. The group is not only a place to vent angst about the current state of politics. In the beginning, the group had a task of the day, such as calling local legislators. The members who knew how to complete the task taught those new to political activism, Schein said. 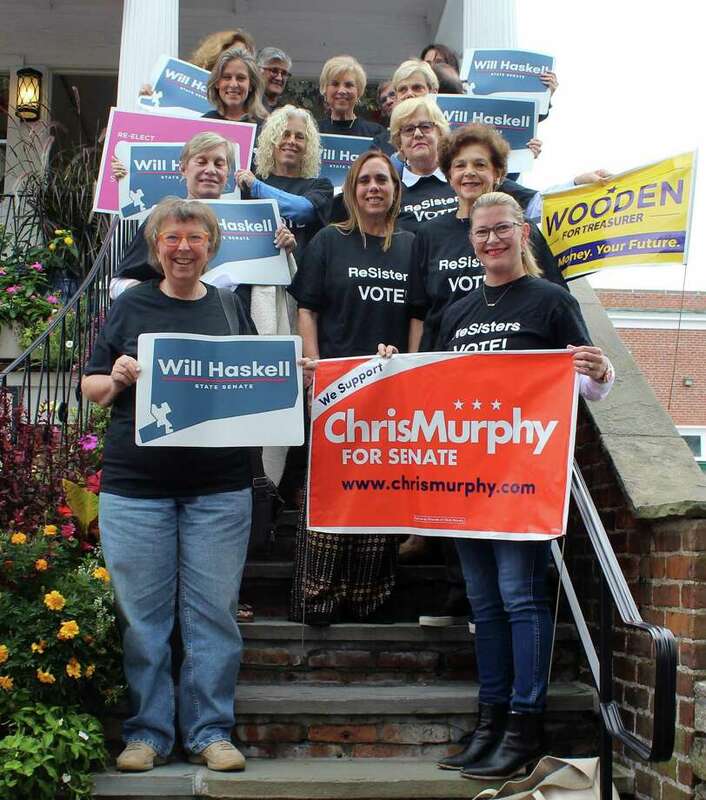 Two years since it formed, the group has grown to become its own entity and its members are energized and mobilized to support local Democratic candidates in preparation of the Nov. 6 election. With her firm voice and focus on education, one could guess Schein is a teacher before knowing she previously taught elementary school in New York City. As meeting attendees spontaneously suggest plans for supporting Democratic candidates, Schein keeps the group focused on action-items, such as signing up for shifts to door-knock for local Democratic state representative candidates and encouraging friends who live in visible locations around town to put up political signs. Intermixed with logistical plans, meeting attendees stand up to give educational and motivational speeches. “Why is it important Connecticut be blue? The reason it’s important Connecticut be blue is because our leaders in Connecticut are a firewall against what’s happening nationally,” Vicki Volper, a local lawyer, fellow Westporter, and one of the group’s founders said. Like Schein and the majority of the Resister’s leaders, Volper said she was not politically active until 2016. “If the federal government doesn’t fund planned parenthood, we can. If the federal government doesn’t treat its immigrants well, Connecticut can treat our immigrants well. If the federal government doesn’t protect the environment, we can protect our local environment,” Volper said. Connecticut used to have a sizeable Democratic majority in the state legislature, the state senate is now tied along partisan lines, Volper added. Loud and raucous, the group’s members, mostly middle-aged and older women, engage with each other in a call and response style that makes the meeting feel like a political revival. Nicole Klein, who ran for, and won, election to Westport’s Representative Town Meeting last year motivated by Trump’s presidency, announced to the group she brought shirts that say Resisters and have election dates on the back. “It has the date that you should vote every year because it’s not just about the presidential election. It’s about every single election,” Klein said of her t-shirts. “And it’s not partisan, everyone should vote,” Volper chimes in. “Exactly, it’s a democracy, right?” Klein responds reiterating the groups larger goal of improving local civil society. While the group’s efforts are focused locally, the pall of national politics is palpable. “If you think you can’t make a difference when you talk to your friends, just think about what happened with Flake. Those two women had a conversation and I have to tell you, that’s why we didn’t get Kavanaugh yet,” Sandy Lefkowitz, a Westporter and one of the group’s leaders, said. The Oct. 1 meeting fell just a few days after Christine Blasey Ford testified she was sexually assaulted by Brett Kavanaugh, but before Kavanaugh’s official confirmation to the Supreme Court on Oct. 6. “Especially this week, women are really feeling under attack and vulnerable,” Fairfield resident Cynthia McDonald, also one of the group’s four primary leaders, said after the meeting.